Love spaghetti but looking for a healthier version to make? If so, check out this guest post recipe courtesy of Explore Cuisine. Looks delicious! Explore Cuisine products are all certified gluten-free, non-GMO and vegan. The various pastas are made with wholesome, organic ingredients and jam packed with protein, fiber, and iron. You can now enjoy classic pasta dishes without concern! Blend first seven ingredients in a food processor. Add cheese. Stream in olive oil. Sauté ginger in oil until crispy. Boil 8 cups of water and pour in Organic Edamame Spaghetti. Cook for 8 minutes. Drain. 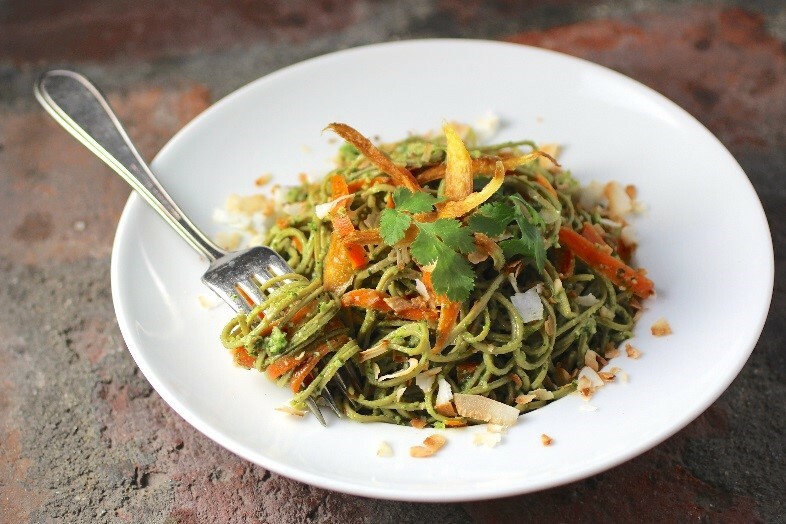 Toss together Edamame Spaghetti with carrots and pesto. Top with ginger and toasted coconut. I have never tried spaghetti made from edamame nor have I ever added coconut to a spaghetti recipe. I love the idea of trying something new and healthful and I always enjoy trying new pesto recipes.